Over the course of this console generation, digital gaming platforms like the Xbox Live Arcade have (justifiably) earned a reputation for being a place where games that one could never reasonably expect to get bankrolled by a big-time publisher could go to thrive and find their niche. Some games – your Castle Crashers, Walking Deads and what have you – have made a big enough splash that the industry at large has no choice but to sit up and take notice. For every game like that, though, there are about a dozen incredibly well-done titles that sneak by largely unnoticed – games that are perfectly wonderful in their own right but may not change the game the way some of the heavy hitters have. Capsized is one of those games. Don’t misunderstand – Alientrap Software’s Capsized is a solid game that takes a lot of well-worn gaming tropes and mixes them into a whole that’s generally enjoyable and mostly cohesive. The game was originally unleashed on PC gamers in 2011, and finally makes the leap to consoles with the XBLA release. 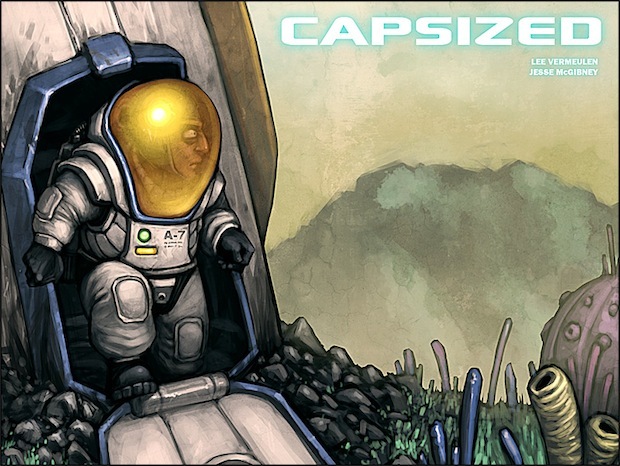 Capsized’s story – ultimately a minimalist affair, told exclusively by way of gorgeously illustrated stills between stages – is that of a spaceship crew stranded on an alien world. Players take control of one survivor of the crash who takes it upon himself to rescue fellow crewmates and find a way off the planet while navigating foreign terrain and hostile native life. This quest will take players through about a dozen large, labyrinthine stages undertaking all sorts of objectives, ranging from simple “find the exit” to more complicated tasks like “save three crew members” or “destroy three mini-bosses.” The narrative is kept largely in the background as this unfolds, allowing level design and gameplay to take the forefront, and Capsized is better off for it. Gameplay is a mix of old-school platforming and shooting, with a little bit of Worms-style “look at all of these gadgets at your disposal” thrown in for good measure. The Little Astronaut Who Could comes equipped with a simple laser blaster and a gravity hook (which can be used to lift both heavy objects and himself), but as you progress through stages you’ll find any number of devastating weapons to use against the indigenous population. Flamethrowers, giant lasers, grenade launchers…any number of death dealing tools of destruction will help you approach combat – which becomes more and more frequent as you progress through the lengthy stages – in any way you choose. It’s not just a wild run-and-gun race to the finish, though. Firefights can get frantic, especially as you get swarmed with enemies, but in order to really find everything a level has to offer you’ll need to slow down and sift through everything with a fine-toothed comb. Secrets abound in each stage, offering hidden power-ups, weapons and other goodies for your Brave Hero, but you won’t find most of them if you just charge through a stage looking for the exit or objective. This is assisted in some later stages, which see you traversing dark, winding caves riddled with death traps and a narrow beam of light in front of your face – rush through those levels and you’ll find yourself a frequent guest at the Pearly Gates. Gunplay can be frantic and heart-pounding, but in between those firefights you’re often forced to slow down and take in your surroundings – a nice mixture of gameplay styles, and one assisted by the fact that the stage layout is clever and the graphics are drop-dead gorgeous. Speaking of the graphics, it’s one of the places where Capsized truly shines. The planet the Astronaut finds himself stranded on is dangerous and inhospitable, but it sure is pretty to look at. Alientrap takes the idea of an exotic, unfamiliar planet and runs with it – stages are filled with strange, lush plant life unlike anything seen on Earth, and colorful, impossible alien creatures (that you’ll constantly confuse for potential enemies) lurk and go about their business in the background. Even hostiles sometimes inhabit areas that make it clear that some care was taken to make stages pop – oftentimes, you’re not just powering through a field or a forest filled with natives throwing spears at you, but small villages and settlements (best not to think TOO strongly about the implications there). That attention to detail is all over Capsized, and as a result this is a game you just can’t take your eyes off of. It helps that the camera is planted far enough away from the Astronaut to give players an almost panoramic view of their surroundings. Aided by this is the superb sound direction; thanks to the music, the uncharted planet takes on a truly alien feel, adding to the sense that players are discovering something beautiful and terrifying. That gorgeous art direction doesn’t mean much if the levels aren’t fun to play through, though. Luckily, Capsized’s stages are cleverly laid out and generally fun to explore – again, secrets abound in each area, and even a thorough trek through some stages may leave some stones unturned. Most stages are large enough that there’s no one right way to the finish – taking that right turn will inevitably lead you to the same place as taking the left. It’s the kind of design that inspires backtracking to ensure you didn’t miss any goodies…and secrets are accessible enough for anyone to find without a terrible amount of effort, but well-hidden enough that doing so makes you feel like a minor genius. Stages are laid out cleverly enough that making it to the end or accomplishing your goal feels like an achievement, and not just another step along the way to the credits. Capsized isn’t without its share of flaws, and most of those stem from the game’s control scheme. It’ll take you a while to get used to the way the Astronaut actually moves – the left stick controls whether he looks left or right and the right stick controls where he’s looking in a rough 180 degree angle. It’s not so much a fault of the game as it is simply different than the way most games of that ilk are laid out. This may also be a case of something being lost in translation – the game was originally designed for a mouse and keyboard, which simply allows for more precision than an Xbox thumbstick allows. It’s not a terrible hindrance once you get used to it, but it can make trying to gravity grapple to a specific point mildly aggravating and threatens to undermine combat at times. Luckily, there’s an auto-aim function for combat, preventing the learning curve from becoming truly frustrating, although it does have a knack to lock onto incidental enemies when you’re in the middle of taking down a mandated target…and God help you if you find yourself swarmed by enemies in one of those dark narrow caverns. Capsized doesn’t reinvent the wheel, and it’s likely not destined to be counted among the XBLA Hall of Fame. But, some nagging control issues aside, it’s a perfectly fine way to spend a few gaming hours in these dry summer months, and the wonderful convergence of gorgeous visuals and moody sound ensure it’s an experience that’ll stick in your memory. It’s not a must-buy – not everyone will be taken in by its charms – but it’s worth trying out, if nothing else. Capsized was developed by Alientrap Software and published by IndiePub. A copy of the game was provided for review purposes.